3 Bedroom Detached Bungalow For Sale in Exmouth for Asking Price £350,000. 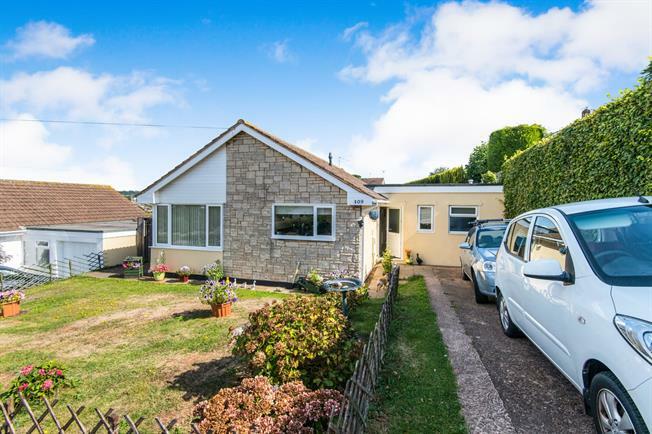 A well presented three bedroom detached bungalow offered for sale with no onward chain and with far reaching views to the estuary and Haldon Hills. The accommodation also comprises of a lounge, kitchen with built in appliances, bathroom, en-suite shower room and utility room. With gas central heating, double glazing and a lovely well established rear garden. A lovely long L shaped hallway with door to the rear garden. A light and bright room with a corner front and side window to take full advantage of the view and patio doors to the side patio. With built-in appliances to include a stainless steel gas hob, waist height oven and grill, fridge and dishwasher. A good size double bedroom with door to the en-suite. With low level wc, wash hand basin and corner shower cubicle. A good size double bedroom with built-in cupboard. Three piece suite with a spa bath. Fitted work top with built-in single drainer sink unit and with plumbing for a washing machine. An established rear garden with flowers and shrubs bordering. Large summer house and side patio with estuary views.